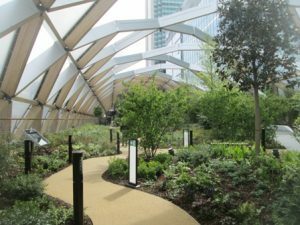 The 5 storey development above the underground Crossrail station which has been built at Canary Wharf opened on 1st May, and I went over for a look. The structure, which above ground is best described as a geodesic tube, provides a roof garden/park on the top floor with shops, restaurants, bars and a cinema on the lower levels. 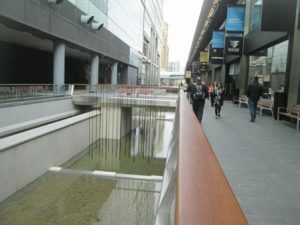 An elevated walkway from North Colonade outside 1 Canada Square provides covered access to the structure. The walk through the roof garden is pleasant but short. It reminded me of one of the smaller glass houses at Kew Gardens. The plants come from all over the world. The roof, designed by Foster and partners, is made of larch beams, aluminum louvers and inflated plastic “pillows”. Gaps are left in the roof for ventilation (and I surmise to ensure that the whole thing doesn’t act as a giant aerofoil and blow off in a high wind). If trees are allowed to grow through the gaps this should provide an intriguing additional effect. It will be good to visit the garden occasionally, but it is not a real destination or somewhere you can walk through to reach somewhere (apart from the lobster restaurant at southern end – yum). There’s not much left of this part of the West India Import Dock either – the landscaping of its remains to the south of the station is half hearted and I’ve seen prettier storm drains (which it resembles). 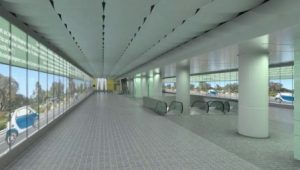 There are ground level accesses from Canary Wharf to the south at the east and west ends of the new Crossrail building. 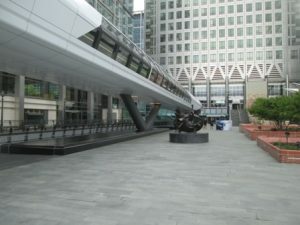 Additionally an elevated walkway from North Colonade outside 1 Canada Square provides covered access to the structure. 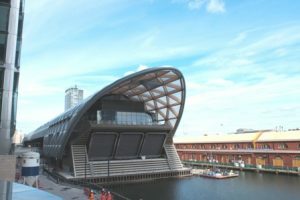 There are plans for enhanced pedestrian access to be provided between Canary Wharf and Poplar through the new building and via an office development to the north of the station. This development is proposed to be built out when the site to the north is vacated by Crossrail (it is currently in use as a car park and for the storage of building materials). However thesre has been little sign, in terms of planning applications, of anything happening in the immediate future on this site which is disappointing for local residents. Well, we’ll have to wait until Crossrail finally opens in 2018 to see for ourselves. At least it will be possible to travel away from the station at lightning speeds, reaching Liverpool Street in 6 minutes, Paddington in 17 minutes and Heathrow in 39 minutes. Crossrail will increase London’s rail-based transport network capacity by 10%, however my contacts have commented that this new capacity will be filled by passenger number growth within 6 months of it opening – regeneration schemes involving high density housing are already well under way along the entire length of the project.